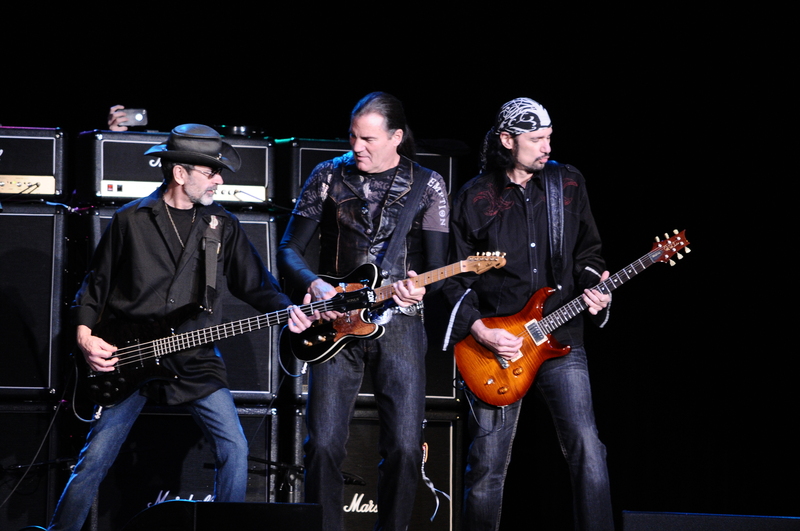 The “American Band”, Grand Funk Railroad, invaded the Seneca Niagara Events Center Friday evening for a sold out show. Boasting a stellar line up of musicians who have now played together since 2000 has only strengthened the band. This show was the bands first for 2013. After a fifteen minute delay, the band finally hit the stage and took off with “Bottle Rocket”. “The Loco-Motion” brought the crowd out of their seats as singer Max Carl led the way and had them dancing in the aisles. A similar thing also happened during “Some Kind Of Wonderful” as well. Those two songs despite being covers are the best versions in recorded music. The band has remained unchanged since 2000, making this version of the band the longest tenured. The band currently consists of original members vocalist/drummer Don Brewer and bassist Mel Schacher. Rounding out the line up are singer/guitarist Carl (38 Special), keyboardist Tim Cashion and former Kiss lead guitarist Bruce Kulick. Kulick did a quick rendition of “The Star Spangled Banner” but other than playing solid all night, didn’t get much of a chance to display his immense talent as much as his fans would have liked. Brewer however was simply on top of his game as usual. Brewer, who also drums for Bob Seger whenever he tours, showed exactly why he is an elite drummer and always in demand. The band closed out their set with the timeless classic “Closer To Home”. The bands biggest tune “We’re An American Band” ended the show on a high note as Brewer faithfully sang and played the song that epitomized the 1970s. Despite a short set time wise, (clocking at around 70 minutes) it was a great way to start 2013 for the band as well as fans who were treated to a slice of rock ‘n’ roll nostalgia.